Downward Dog is a yoga classic! It’s integral to a Vinyasa practice and one of the core poses in Ashtanga. And everybody’s doing it, right? Let’s make this pose perfect, so that we can feel energy moving freely, lengthen the back of the body and redefine our connection to the earth through our hands and feet. Ready? 1. 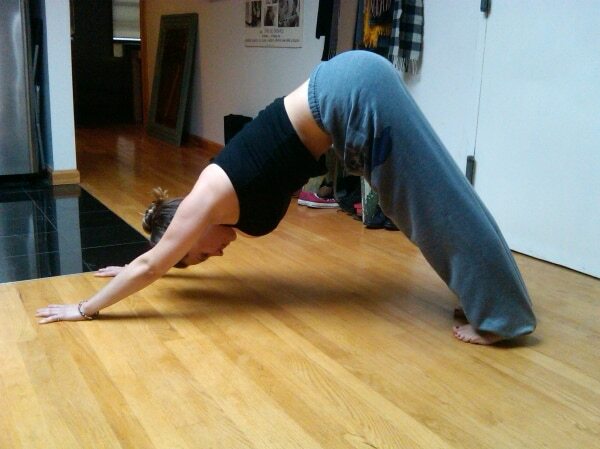 In Downward Dog, you are basically making an inverted V-shape, with equal weight on your hands and feet. Hands are shoulder width apart, with wrists facing directly forward. Feet are hips-distance apart and parallel. 2. As for the length of your Dog, roll forward to plank, adjust the distance between your hands and feet here and then press back to Downward Dog, resisting the temptation to adjust your hands and feet. 3. Spread your fingers out and press down through the entire palm of your hand. Reach your heels towards the floor. Your heels do not need to be flat – as long as they are reaching for the floor, you’re good to go and have somewhere to work from. 4. As the hands press down, feel like you are able to draw energy up the arms. Slide the shoulders onto your back and lengthen the sides of your waist. Reach the sit bones up and back, as if they were an extension of the hands. Feel the very bottom of the tailbone release towards the heels. 5. Pull the navel into the spine – try and see if you can pull your bottom, floating ribs into your body. 6. Open up the backs of legs by engaging the fronts. Press the shins back, pull the knee caps up the legs and engage your quadriceps. Feel as this allows you to reach the sit bones higher and press the heels lower, getting more length in the hamstrings and low back. 7. Now relax your head and neck and let the head hang heavy. When you are first starting out, gaze at your feet in Downward Dog. As your flexibility increases, move your gaze to your thighs and then finally to your own navel. 8. Breathe and remember: the more you do it, the easier it becomes! Once you have practiced a lot, Downward Dog becomes a resting pose and a refuge during a tough practice. Take a deep inhale and feel energy drawing up through your hands, lengthening along your spine and on the exhale, feel energy moving down the backs of the legs, through the feet, into the floor. Try it in your living room, like me. Share the post "Perfect Your Down Dog: Adho Muka Svanasana"
Yeah Kyle, you just inspired me into an early afternoon, living room down dog session!